Where is ground zero for hipsterdom in America? Would it be Portland or New York? Not quite, according to a recent analysis from FindTheBest.com The site searched cities across the country for the classic signs of hipster populations, and found a surprising number in middle America. The definition of hipster is admittedly squishy -- this is not a group easily forced into stereotypes --but they are generally thought to share some characteristics. They have an "effortless nonchalance," according to FindTheHome. Their preferences cross societal lines, blending cheap beer and organic food, wordly cynicism and an aspirational idealism, recycled furniture and ultra-cool clothes. Young people. Hipsters can be any age, of course, but they're more likely to be between 20-34. Education. A high percentage have a bachelor's degree. Cafes. Where else would you debate the best method for brewing pour-over coffee? Yoga studios. Because apparently hipsters and yoga are BFFs. So when you look at the country through those hipster-colored lenses, what do you see? Click ahead to see the 19 most hipster cities in America. Oh sure, Portland gets all the attention -- and a satirical television show taking regular pot shots at hipsters. 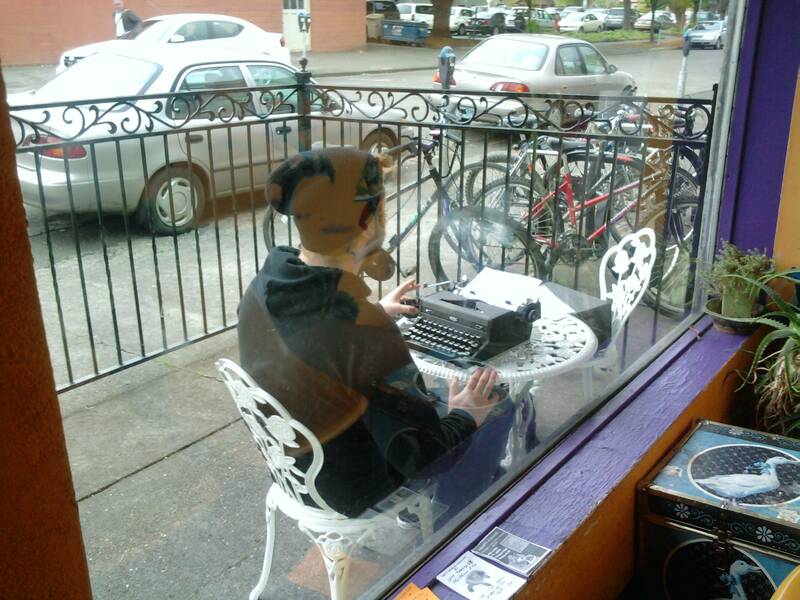 But the small Corvallis is where you can snap photos like this one of a young, bearded man sitting outside a cafe typing on a manual typewriter. This guy "has been able to exceed in hipstering at a level beyond that of the record player hipster," wrote one user on the Reddit website, where the photo appeared. Moving to Des Moines is the most hipster thing possible, proclaimed the National Journal last year. With its foodie restaurants, basement bars, comic book stores and affinity for technology, Des Moines is "a destination for people who want to create something meaningful outside of the limits imposed by an oversaturated city like Chicago or New York," writes the publication. Iowa City is home to the University of Iowa, and the area surrounding the campus was voted a top hipster locale by RealtyTrac in 2013. For RealtyTrac, the evidence of hipsters included a high percentage of young people, renters and residents who walk or take public transit to work. Of course San Francisco would make the cut. The city has been a hub of independent, counterculture thinking for decades. And now, even as longtime residents complain about gentrification and the influx of wealthy tech workers, San Francisco remains attractive to the hipsters who can afford to live there. This is a city where artisanal toast sells for $4 a slice -- and people adore it. Toast is the "tip of the hipster spear," one coffee shop manager told Pacific Standard magazine last year. Ann Arbor already has some hipster cred because the University of Michigan is there. It gets more high marks for making fun of its trendy tendencies. One group of residents poked fun of its hipster population in 2013 with a video called "Ann Arborland: Hipsters." In the video, two hipsters meet at a cafe to order coffee (since the Indonesian green tea is "bland and pedantic," says one) and try to outdo each other with stories about how alternative their lives are. As the city left behind its grungy industrial core and welcomed an influx of educated, young tech workers, hipsterdom was the natural next step. Seattle has always prized its coffee culture -- a little chain called Starbucks (SBUX) was born there, after all. But the city has plenty of other elements that would make any hipster feel at home, including upscale farmer's markets, fringe art shows and themed bars. Bloomington stands out in the staunchly conservative state of Indiana. The college town has been a hippie stronghold for decades, and now it can tick off most of the hipster boxes. Cool record store? Check. Annual world music festival? Check. Brewery with locally sourced food? Of course. Provo isn't your typical college town. Its chief resident, Brigham Young University, regularly tops Princeton Review's list of "Stone Cold Sober Schools." You're not going to find a vast college bar scene here. Still, Provo does have its share of hipster hangouts, including the weekly food truck roundup, live music cafes and restaurants that blend entire pieces of pie into milkshakes. What's a good hipster list without Berkeley on it? In true Berkeley fashion, residents have put some deep thought into what being a hipster actually means. "Hipsters are people who dress like artists but don't actually make anything and who like to do things that no one else likes because no one else likes it," one UC Berkeley student told The Daily Californian. Another student said the movement may be centered around a working-class state of mind. "It's all about not trying and about appropriating the style of the working class without being the working class," she told the newspaper. "It's about being effortlessly cool, which is silly because it takes more effort to try to look effortless." Hipsters in Davis apparently love to poke fun at themselves. First, some residents filmed what they call "a hipster Western" showing two men texting the same girl in an electronic duel. 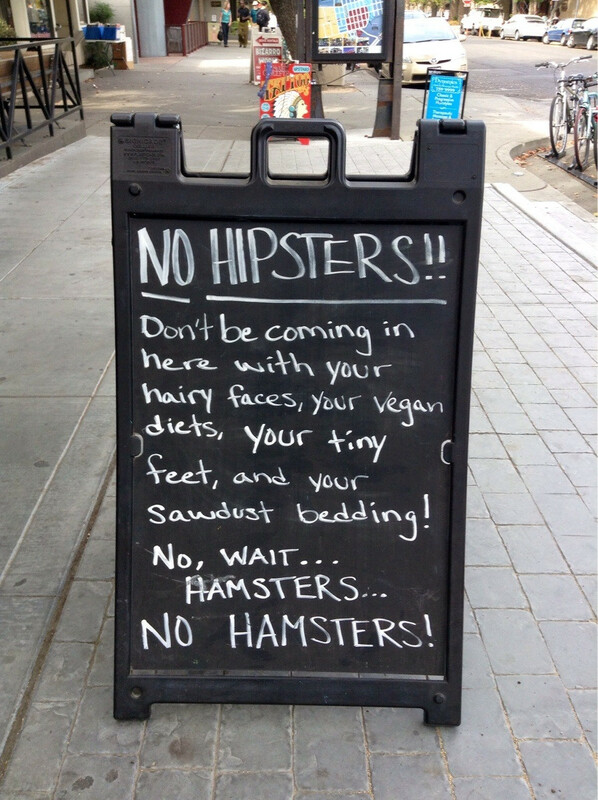 Then, a photo made it to Reddit of a sign outside one Davis establishment that said, "No hipsters! Don't be coming in here with your hairy faces, your vegan diets, your tiny feet and your sawdust bedding! No, wait... hamsters... no hamsters!" The hipster tour through California continues with Santa Monica, which is famous for its beaches, amusement-park pier and laid-back vibe. You may not be able to find a better hipster bar than Basement Tavern on Santa Monica's Main Street, which offers dim lighting, taxidermied animals, truffled french fries and old black-and-white movies playing on the walls. Hipsters in Alabama? Oh, yeah. The city of Birmingham, for one, is becoming "Hipsterham," writes columnist John Archibald on AL.com. "All those giant lenses and Doc Martens and flannels," he adds. "You can't walk a block downtown without tripping over a pair of skinny jeans." The hipsters have crashed Auburn as well, but good luck finding anyone who will actually admit to being one. "I appreciate a good hipster," a student at Auburn University told the school newspaper last year, "but I don't think any hipster would call themselves a hipster." Arlington also scored high on RealtyTrac's list of the most hipster-friendly areas in the country, but residents there were quick to dismiss the idea of hipsters in the neighborhood. "Many, myself included, move to Arlington to avoid hipsters," wrote one commenter on the Arl Now blog. "Arlington lost its hipster cred a while ago when all the interesting things were plowed under and replaced with Cheesecake Factory, Orvis, Gold's Gym and more frozen yogurt places than anyone needs," wrote another. "We've got more bros than anything now." All the hipsters in Somerville have led to some soul searching in the city. "I'm the oldest man in Somerville," one 60-year-old groused to The Boston Globe. "The hats, the tattoos, the tight skinny jeans -- on the guys. It's like they're trying to out-hip each other." Now, Somerville is worried that it's getting too hip, The Globe reports. "We don't want to lose our soul," the mayor told the newspaper. This one's a little iffy. College Station may have plenty of coffee, but bona fide hipsters are more likely to be seen in Austin and Denton, according to some observers. In College Station, home to Texas A&M University, "the ever-intensifying dudebro culture is growing," wrote one former resident on Quora. The Boston Globe named Cambridge the hipster capital of the state because of all the city's renters, hybrid cars, colleges and hip stores. The Harvard Crimson disagreed with the methodology, however, saying that hipsters were much more likely to ride a fixed-gear bicycle or walk than drive a hybrid car.And the Globe includes Starbucks in its list of "hip" stores, which the Crimson says is a no-no. "We're pretty sure rule number one of hipsterdom is to steer clear of Starbucks," writes the Crimson. The women wear vintage cowboy boots. They all lean toward extreme liberalism politically. They like indie music and foreign films. They drink Pabst Blue Ribbon. "Boulder's hipsters are like overly educated, indifferent snowflakes," the publication writes. While many hipsters would adamantly deny falling into the category, Ames is OK with the label, according to Iowa State University's student magazine. Ames "is home to a group of self-aware kids who realize they're part of the hipster culture, and are totally chill with it," the magazine writes. Seriously, Hoboken? The hipsterian hub of the country? As it turns out, the city skews young, with nearly half of the residents between the ages of 20 and 34, and is incredibly educated, with nearly three-quarters having graduated college. Hoboken might have once been too homogenized and flavorless to rank high on the hipster charts, but lately it's becoming the new refuge for people fleeing Brooklyn's high prices and fast-paced gentrification. The average condo in Hoboken cost $590,912 last year, compared with $1.5 million for North Brooklyn, The New York Times reports. "Hoboken is anyone's hipster paradise," one observer wrote on Twitter last year.